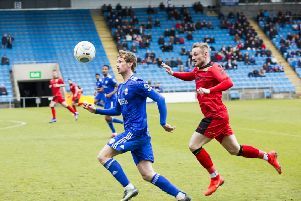 FC Halifax Town crashed to a 3-0 defeat against Woking in the National League. Two goals from Dan Holman (11, 60) and a strike from John Goddard (58) did the damage. Defeat leaves Halifax second-from-bottom, with 10 points from 16 games. FC Halifax: Glennon, Bolton, Brown, Banton, Roberts, James, Bencherif, Sadlier, McManus, Burrow, Tuton. Subs: Porter, MacDonald, Hughes, Brooks, Hamilton. Woking: Cole, Caprice, Saah, Thomas, Arthur, Murtagh, Ricketts, Jones, Daniel, Holman, Goddard. Subs: Hamann, Sole, Poku, Andrade, Keohane.